During refugee week there was an exhibition of art works made by asylum seekers. It coincided with further revelations about the collection of information by security agencies in Britain and the United States. The juxtaposition of these incommensurate events offers food for thought about the importance of remembering. 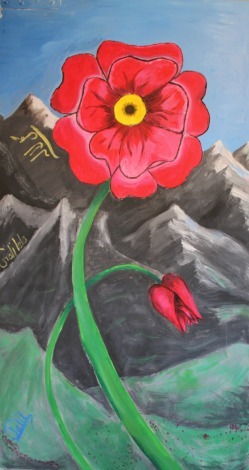 A highlight of the exhibition was a young Afghan asylum seeker's painting of a brilliant red flower. When asked what it represented, he said it recalled the flowers he used to pick for his mother on the hillsides near his village. As he shared this memory his hearers no longer saw him as an asylum seeker but as a person who was seeking protection from them. They now saw him in his freedom, connected with a rich world and making a claim on his hearers through their connection with him. That is a small example of the power of remembering. When Polish Jews were herded into the closed Warsaw Ghetto, Chaim Kaplan kept a diary. He died but the diary survives to ensure, as he promised, that 'in our scroll of agony, not one small detail can be omitted'. The Russia poet, Anna Akhmatova, recalls how during Stalin's purges she stood in a queue of women outside the Lubyanka prison, all seeking news of their disappeared husbands and sons. She was asked if she could describe all this. She answered that she could, and she did. The call to remember was a trust she held for the nation and humanity, not just for herself. Remembering and recording, whether through words, paint or music, are the most personal and private of activities, requiring space and silence. They are also a deep affirmation of human freedom. To remember says that you can rise above the things that are done to you, that the story of your life and destiny cannot be controlled, and that you are intimately connected to other human beings and to your world. You are a free person and not a thing to be manipulated. In its effects remembering is also the most public of activities. That is why the powerful try to control the telling of history. In the Warsaw Ghetto and Stalin's Russia it uncovered the true character of a state that, in the name of security, tried to make people nameless and disconnected, with the value only that the state gave them. The freedom of remembering exposed the emptiness of an apparently all-controlling state. Remembering also recovered the responsibility for their actions that people had ceded to the state. It reaffirmed that the jailing, torturing, killing and exiling of human beings had been done by other human beings, and that other human beings had yielded to their fears and been beguiled by the dream of security, had consented, turned their eyes away and remained silent. Remembering made clear that they were free to do or to decline to do these things. Finally, remembering makes a claim on later hearers to recognise that as free human beings they are connected with those who remembered and who were remembered. In the name of freedom they are called on to resolve, 'Never again'. One day surely when the stories of people who sought protection in Australia are remembered, another generation will also wonder and say, 'Never again'. The remembering and recording involved in the collection of information by the United States and Great Britain is of a quite different character. It is an act of the state, conceived and carried out in secrecy, in the name of public security. It is private, not personal, but it has public consequences. In contrast to the remembering by the young African man, Chaim Kaplan and Anna Akhmatova, this kind of recording does not express personal freedom and connection, but rather their denial. It appropriates the personal connections that underlie human freedom and makes them a possession of the state. It treats people as things and not as free human subjects and encourages society also to take that view. This secret remembering also conceals the true character of the state and transfers to it the responsibility that human beings have for acting on its behalf. This is profoundly inimical to freedom. This kind of remembering, too, makes a claim on its citizens to accept the control of the state and to deny their human connection with those of whom it disapproves. It takes us into the world of Dostoevsky's parable of the Grand Inquisitor, that kindly, sad man who offers people security and material prosperity as ultimate goals. But he takes from them knowledge of the ways in which their world is built and responsibility for it. They are made into children, their freedom rendered trivial. The young Afghan man and the Security Agencies of the United States and Great Britain are all in the business of remembering. One invites us to celebrate human freedom, the others to despair of it. Thanks Andrew. One could also illustrate your point by referring to the struggle in our near neighbours Indonesia and Timor-Leste to control public memory. The Indonesian state used its version of the pogroms of 1965 to legitimise the Soeharto regime but, with the advent of democracy post-Suharto, is losing control of that narrative as the new film Act of Killing, to give just one example, demonstrates. In Timor-Leste, the more triumphal Resistance version of their struggle is taking over from the victims narrative. As I comment in my book At the Scene of the Crime, Indonesia celebrates its disastrous 1975 military takeover which it called Operation Lotus Flower (!). Timor-Leste now prefers to label it their heroes day, deflecting attention away from Indonesia. The politics of Timor-Leste's relationship with Jakarta is the determining factor not the painful, though complex, truth. As always, your words ring true and challenge the complacency of those who tell themeselves that these things happen elsewhere, in other times, to other people. I have just been rereading the poems of Akhmatova's friend and contemporary, Osip Mandelstam, another casualty of the Stalinist state who, like Solzhenitsyn and so many other writers and artists, realised he had no choice but to bear witness -- the 'choice' in his case being not 'freedom or death', but '(inner) freedom and death'. Those of us who do not face such choices on a personal level have a duty of conscience to at least honour and remember those who did, and do, and your essay is a practical demonstration of this. Thank you.